Regional droughts, particularly in California and Texas, have been widely covered in the national media and most Americans are well aware that solving water scarcity and quality issues is key to sustaining our enviable standard of living. Across the United States, readily accessible water supplies have been exhausted and municipalities are struggling to find or develop alternatives to meet increasing demand for potable water sources. These challenges are complicated by the fact that population growth and continuing shifts in density increase the burden on aging water and wastewater infrastructures. Devastating sinkholes and torrents of water spewing from broken pipes make impressive headlines, but the public eventually feels the real impact of deteriorating treatment facilities and distribution lines in increased utility costs and demands for higher taxes and specialized bonds. At the same time, there is a rising public and regulatory demand to increase the quality of discharge effluents into our waterways, fueling industry efforts to develop more efficient ways to process waste streams. Currently, only 5% of treated wastewaters are reused for irrigation, industrial processes, and other applications. Even in regions with severe water scarcity, the majority of municipal wastewaters are simply discharged into some type of downstream surface water. Membrane technologies address all of these issues and have proven themselves as a viable and cost effective option. Reverse osmosis (RO) is a well established technology, proudly developed in the U.S. in the 1960’s with a base of system installations around the world producing high quality drinking and process waters. More recently, microfiltration (MF) and ultrafiltration (UF) membrane systems have enjoyed exceptional growth, producing high quality feedwaters to downstream RO systems and as stand-alone filtration methods for a variety of applications. Membrane filtration offers consistent and reliable water quality and expands the options for indirect use of treated waste waters including: aquifer recharge, barrier protection, and discharge into reservoirs and lakes. Municipalities that recover their own wastewaters rather than simply discharging those finite resources downstream, simultaneously increase their volume of available source waters. More and more cities and states are recognizing the benefits of advanced membrane treatment and Texas has been especially active. With a long history of droughts, the current crisis began in 2011 and is now affecting almost 13 million people, roughly half the state’s population. Water scarcity is also stifling industrial growth as corporations interested in establishing facilities in Texas hesitate due to concerns about the current and future availability of water for their processes and personnel. To help mitigate these issues, several Texas municipalities have embraced direct use of treated waste water to supplement demand. In July of this year, the City of Wichita Falls installed a direct potable reuse facility. Municipal wastewater is disinfected then treated with a chemical coagulant to remove suspended particles. The water then passes through a MF unit and a downstream RO and the final permeate is treated with advanced oxidation using ultraviolet (UV) light. This water is then distributed to a lagoon and blended at a 50:50 ratio with lake water which is the source water to a downstream conventional treatment plant. Big Springs, Texas also increased its available water volume with a similar process that includes UF, RO, and UV. The treatment of residential and industrial wastewaters is another challenge that can be successfully addressed using membrane technologies. Conventional treatment methods include settling, digestion, and disposal but the related equipment has a relatively large footprint and requires a significant amount of land. While the effluent from these processes does meet current requirements for surface water discharge, there is an increasing desire to discharge a higher quality and more environmentally-friendly effluent stream. These demands have prompted an increased interest in membrane bioreactor (MBR) technologies. MBR’s are a hybrid of advanced sludge processing and MF/UF membranes with pore diameters smaller than most bacteria and viruses, effectively reject them. MBR schematics typically include coarse then fine screening, an anoxic and aerobic zone, and usually an anaerobic zone prior to the mixed liquor contact with the membranes. 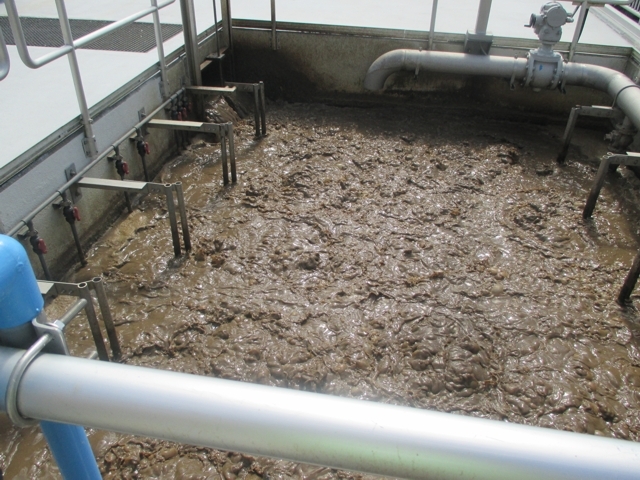 The membranes are immersed in that mixed liquor of biosolids and the water is removed, producing a filtrate that is low in nutrients and free of most pathogens. MBR’s allow the recycling of solids into the process, producing a more efficient solids digestion and reducing the overall volume of sludge for disposal. A typical MBR system also requires 60% less space than a conventional sewage treatment plant and produces a low odor, high quality effluent that demands less disinfection chemistry. In many cases, it’s possible to retrofit a conventional treatment plant into an MBR facility, converting on-site tanks to house submerged MBR membranes. MBR’s are flexible and can be designed and built to anticipate future expansion for increased capacity. 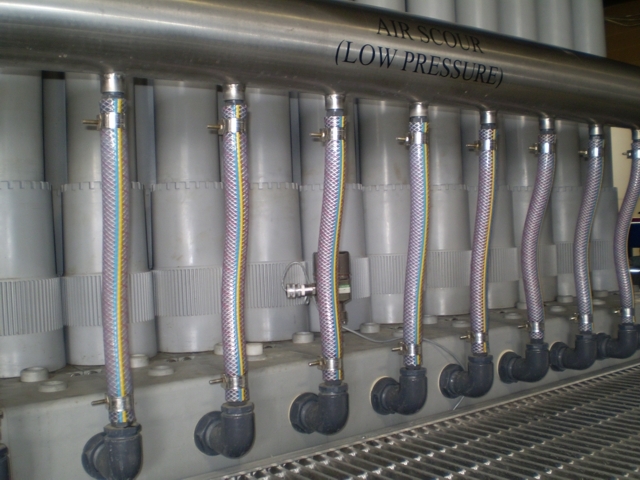 Membrane system design continues to evolve and recent trends in MF and UF in particular are a response to industry pressures for a “universal MF/UF rack design” that accommodates a variety of membrane configurations. This shift allows end-users to select membranes that meet their site-specific needs and competitively source future membrane purchases. The Northwest Membrane Operators Association (NWMOA) hosted its annual meeting in Vancouver, WA this year and included an open debate by a panel of experts on this topic. While some believed that flexibility in system configuration and accommodating a specific membrane was necessary to ensure design performance, others believed that the benefits of a universal design and the ability to freely source competitive membranes could not be ignored. There is little doubt that the market will set the trend though it already appears as if a one-size fits all MF/UF system design has found a niche. RO, MF, UF, and MBR membrane technologies have proven to be an effective and reliable option for the production of potable water, the treatment of waste water, and the reuse of effluent waters to augment scarce resources. Technological developments offer increased system efficiency, higher quality effluent, and alternative water sources and help end users mitigate regional water quality and supply challenges.